I would have finished this sooner, but I had to wait till I could get to town for thread. And I would have blogged it yesterday but the teenager had the camera batteries! So here is Hotpatterns 1089, The Three Graces T shirt, take two. (Same fabric, totally new top) I've altered it very slightly from the original version - in about 6cm (total reduction) at the waist, and out about the same at the hip. I hemmed it at 3.5cm instead of the 5cm allowed, and messed with the neckline to make it less bulky where back meets front. 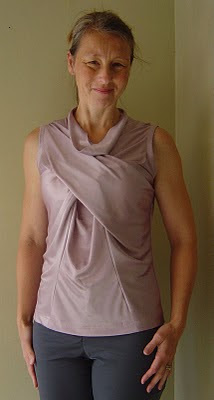 I also omitted any form of sleeve, since I think it would have been too much in this shiny fabric. (And I like sleeveless tops - with a layer under for warmth I can wear this year round) I just used cross grain strips of self fabric to do a binding/facing on the armholes. Looking at these photos I think I should have spent a bit of time in front of the mirror arranging it to sit better, but it's probably better to have a truer representation of how a garment looks in the real world! Back. Despite my waist reduction it's still not very shapely. I might have a fiddle with pinning out a little more on this one to see if it looks better, but I 'm not at all unhappy with this shape. I wonder whether the addition of a cb seam for additional shaping would be worth doing? Yes, I like it a lot! Lovely. I think a CB seam would suit you/it perfectly. It is a very unique and feminine top. With complex draping like that the price is always a factor. Yep, I've never bought a HP pattern either, and never will, they are just too expensive for overseas. Glad to see you're okay after the earthquake. I think it is beautiful. in the right situation and fabrics - a stunning evening top!